This year, the weather has gone through a whirlwind of highs and lows (no pun intended), and who's to say when the warm weather is going to be here for good? While the weather may not change to the appropriate climate for this time of year, our menu sure will. To ensure this, we are serving a light, yet filling pasta reminiscent of the warm Mediterranean. We serve fresh ciliegine mozzarella with shallots, applewood smoked bacon, grape tomatoes, capers, and basil in a white wine broth over bowtie pasta. 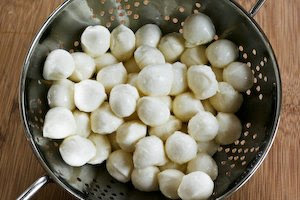 Ciliegine is an Italian mozzarella that translates to "cherry size," and is generously spread throughout the dish to add a richness and creaminess that pushes itself forward in an otherwise light dish. Paired with freshly julienne basil, it provides a peppery, yet sweet finish to the creamy mozzarella. While we can't guarantee the weather is going to turn around, we can guarantee that our Italian-themed pasta dish and a night on the patio can change your attitude in a heart beat.